For custom original oil's paintings or on site hand painted Mural, please call tell: (321) 257-9294. Click here to view our Return policy . Click here to order a Book. We accept check or credit card payment. To Pay by check US funds: Please make payment to Yves Lanthier and send it to the address mentioned at our contact page. We setup a personalized payment tailored for each item. Large Trompe L'Oeil on canvas True Giclée reproduction. Custom designed Murals, Niches, Ceilings, Domes and Borders are available hand painted on site or on on canvas. We also offer a wide range of Murals, Niches, Ceilings and Borders, Giclée canvas reproductions, available up to 16 ft wide and u to 150 ft long in one piece. They can be shipped anywhere and easily installed by any good wallpaper hanger. Click here to see our collection. The price is determined by the size, plus shipping and handling. Take advantage of this great product, it is remarkable and for a fraction of the cost of an original hand painted. Take an additional 15% discount on two of the same painting order. This pricing does not include shipping + handling charge. Return policy: There are no refund on any order as we custom make each order and have to pay manufacturer independently. 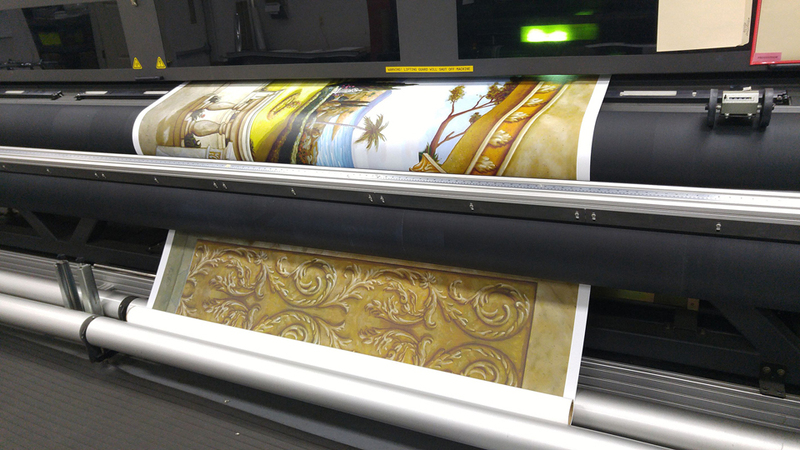 We will only replace the Giclée within 30 day's if it is damage in shipping or has manufacturing flaws. Canvas Giclées Size & Price. The price for canvas Giclée is $30.00 per Sq. Ft.
You can use our square foot table (see below) to calculate the price of your Giclée. By taking the approximate square footage of the size Giclée you are looking for and multiplying it by $30.00 per square foot. If your order is exciding in SQ inches you can calculate $0.20 for each Sq additional inches. There are 144 square inches per square foot. Example: If you have a 6'.5" x 8' wall space to cover, that would total 44 square feet. Then multiply the total 44' sq. ft. by $30.00 = $1320. You then can refer to the table below for the stander dimension and price. Note: For standard "Giclée" murals allow up to two weeks for delivery.